Learning and memory are crucial events during adolescence, when the brain is maturing both physically and functionally. Thus, it is not surprising that cognitive processes are exquisitely sensitive to the effects of chemicals such as alcohol. Among the most serious problems is the disruption of memory, or the ability to recall information that was previously learned. When a person drinks alcohol, (s)he can have a “blackout.” A blackout can involve a small memory disruption, like forgetting someone’s name, or it can be more serious—the person might not be able to remember key details of an event that happened while drinking. An inability to remember the entire event is common when a person drinks 5 or more drinks in a single sitting (“binge”). Learn more about the formation of memory. In order to affect cognitive functions such as learning and memory alcohol must first enter the brain. Due to its small size alcohol in the blood can passively diffuse (through the blood brain barrier) into the brain. The ability of alcohol to cause short term memory problems and blackouts is due to its effects on an area of the brain called the hippocampus. 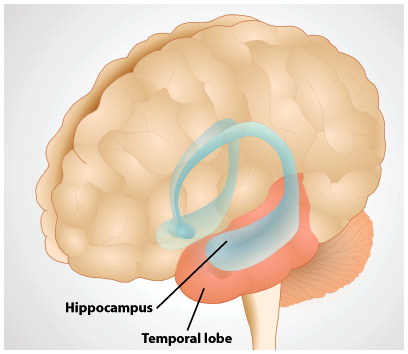 The hippocampus is a structure that is vital to learning and the formation of memory. Learn more about the passive diffusion of alcohol through the blood brain barrier. Review the basics of neuron structure. Thus without a properly functioning hippocampus learning and memory become problematic. In fact there is a famous story about a patient H.M. whose hippocampus was actually removed surgically in an effort to relieve him of uncontrollable seizures. Read all about H.M.’s incredible story. When alcohol reaches the hippocampus it decreases the electrical activity of neurons by binding to specialized proteins (or receptors) that are embedded in the neuronal membrane. The decreased firing of impulses in the hippocampus disrupts the formation of the short term memory and accounts for the subsequent blackouts experienced the next day. Over time with repeated use of alcohol especially by people who binge drink alcohol can cause actual damage to the hippocampus leading to more sustained cognitive and memory problems. Interestingly the hippocampus is a unique structure in which new neurons are constantly “being born” and this neurogenesis plays a very important role in learning and memory. One of the ways in which alcohol can damage the hippocampus is by disrupting neurogenesis.